A peer-reviewed paper released today in the online journal PLoS One documents deaths due to anticoagulant rodenticides in fishers, an elusive forest carnivore in the weasel family. The study shows that a high percentage of fishers tested have been exposed to these rodenticides. The study was led by UC Davis, and involved researchers from the nonprofit Integral Ecology Research Center, UC Berkeley, United States Forest Service, Wildlife Conservation Society, Hoopa Tribal Forestry, and the California Department of Fish and Game’s Wildlife Investigation Lab. 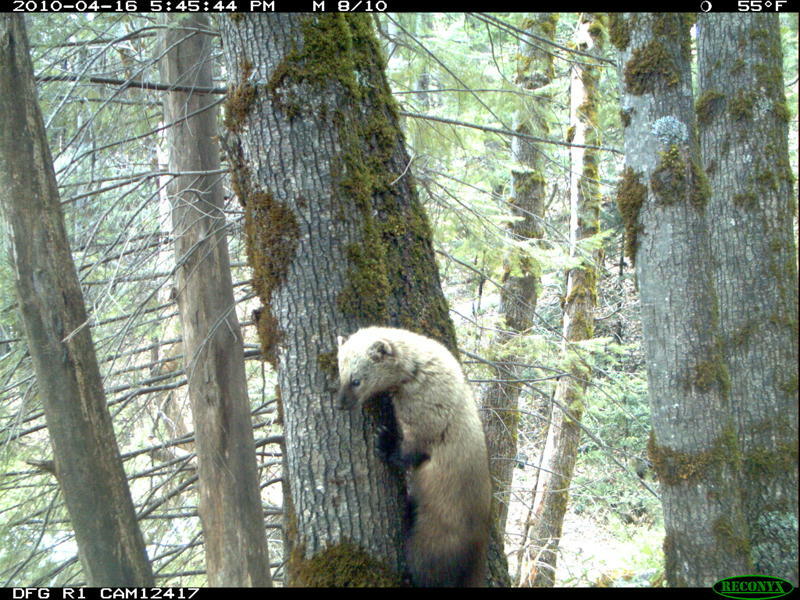 The research team was surprised by their findings because fishers live in the mature forests of the national forests, national parks, private timberland and tribal community lands – nowhere near urban or agricultural areas where one might expect to find evidence of rodenticide use. Examination of the areas where exposed fishers lived shows that their habitat overlaps with illegal marijuana farms. Large amounts of rodenticide and other chemicals have been observed around marijuana plants and along plastic irrigation lines that supply the grow sites. Other species that inhabit the forests and share the same prey as fishers, like martens and spotted owls, and Sierra Nevada red foxes may also be at risk. The research team hopes to continue this work and examine whether toxicants used at illegal marijuana grow sites on public lands are also indirectly impacting fisher populations and other forest carnivores through prey depletion. Link to the paper in PLoS One. Link to UC Davis press release. A few weeks ago, our avian disease specialist, Krysta Rogers, was notified of an ongoing incident in Kern County. A man reported finding two to five dead birds at a time near his bird feeder over a period of weeks. This added up to 30 to 50 birds in total, most of which were mourning doves. Often, mortality occurring near bird feeders is disease-related. Bird feeders can unnaturally congregate birds, increasing the chances of disease transmission. In particular, mourning doves are highly susceptible to a parasite that causes a disease called Trichomoniasis. 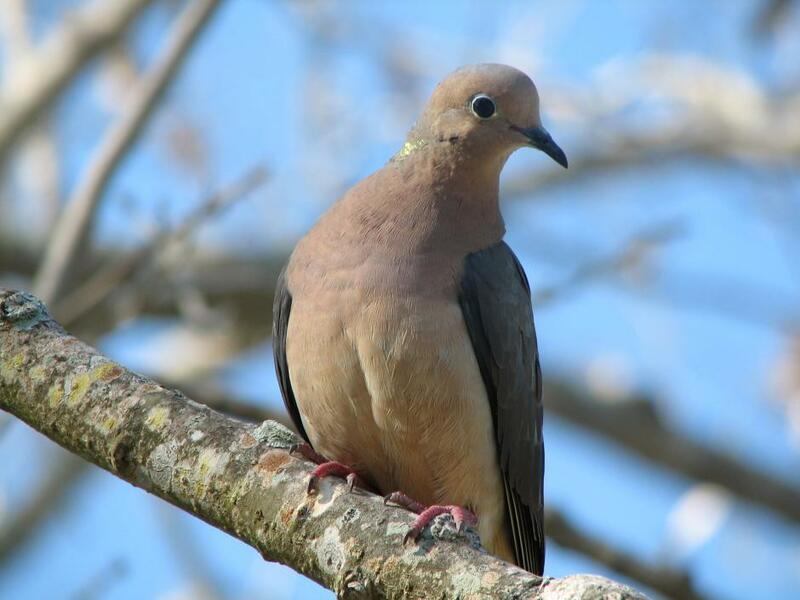 This disease can lead to significant mortality of mourning doves; it tends to occur during the spring in doves that visit bird feeders. However, in this incident a raptor and the neighbor’s dog also had died in the same location and a similar scenario had occurred the previous year. As such, this incident seemed to be more likely related to a toxin, rather than disease. Our pesticide specialist Stella McMillin became involved to investigate the cause of death. Fortunately, Krysta and Stella were able to examine two doves that died during this incident. Examining the doves, they found no evidence of disease. 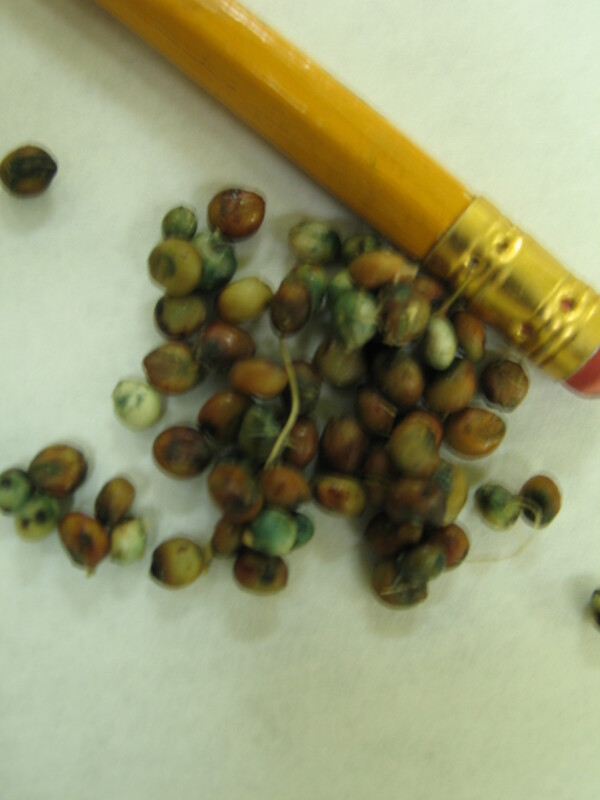 However, when they looked in the birds’ crops we found both of them full of the same milo seed-like material. They showed a picture to the Kern County Agricultural Commissioner’s Office who suggested that it appeared to be strychnine bait. So, they submitted the bait and livers from the birds to a diagnostic lab to test for strychnine and the results were positive. Strychnine is used to control pocket gophers and is only legally applied underground to prevent exposure to non-target wildlife. In this case, unless these doves had been using shovels, it appears that the application was not done properly. Some formulations of strychnine are restricted only to those with applicator’s licenses but others are available to the general public. Sometimes the general public is not aware that “the label is the law” – it is illegal to use a pesticide in a manner not specified by the label. When a pesticide, particularly something toxic to vertebrates like strychnine, is not used properly, it poses a hazard to wildlife, pets and children, so investigation of these cases is important. Now the difficult part begins – identifying the source of the strychnine and taking action to ensure that this situation does not occur again. Although this incident was not related to disease, it is a reminder, that bird feeders, hummingbird feeders, and bird bathes, should be thoroughly cleaned at least once a week to reduce the chances of spreading disease. For more information about how to keep birds healthy at bird feeders visit the National Wildlife Health Center (http://www.nwhc.usgs.gov/publications/fact_sheets/coping_with_diseases_at_birdfeeders.jsp) and Audubon (http://web4.audubon.org/bird/at_home/bird_feeding/feeder_maint.html). I was returning to the Region 2 office from UC Davis Tuesday June 19 when I saw an injured hawk in the shoulder of the fast lane – right on the yellow line of eastbound Interstate 80. Pulling into the shoulder near the center divide, I assessed the situation and made a call to Wildlife Investigation Lab’s (WIL) Stella McMillin, Krysta Rogers, and veterinarian Deana Clifford. Our rescue mission was simple, but dangerous: rescue the hawk from the freeway in a manner that was safe for the hawk, me and freeway traffic. The hawk was alive but injured, and I sensed that if I approached it, it might go directly into traffic. If I were to do nothing, the hawk still could head into traffic and cars were starting to swerve to avoid the hawk. Stella and Krysta called the California Highway Patrol while Deana contacted Yolo County Animal Services for further assistance. She also alerted the UC Davis Veterinary Medical Teaching Hospital (VMTH). CHP Officer Marco Rivera was on the scene and ready to help within minutes. While going over a rescue plan, the hawk managed to move into the center divide among the oleander bushes – safely away from traffic. Knowing this was our window to safely act and once I guaranteed to Officer Rivera that I could capture the hawk and safely contain it, he acted. After briefly halting all the eastbound freeway traffic for me, I was able capture the hawk and place her in the only animal transport carrier I had – a live animal trap. I know this is not the ideal carrier for a raptor (or any bird), but it was all that I had in my vehicle and a freeway hawk rescue was not on my list of things to do that day! With the hawk safely in my vehicle, Officer Rivera escorted me to the Yolo Fruit Stand where I met up with Yolo County Animal Service. With the danger of the freeway behind us, we agreed I would take the hawk to the VMTH for evaluation. 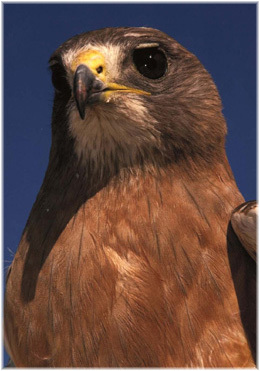 Swainson’s Hawks are a state threatened species and populations are declining throughout much of their range. In the Central Valley, these beautiful birds arrive in early March or April to breed. The breeding season can last through August until they gather again to start fall migration. Most of these hawks winter in Mexico, Central and South America. This species is one of the many that is vulnerable to pesticide poisoning. Pesticide use in Argentina was responsible for the deaths of nearly 6,000 individuals in 1995-1996. 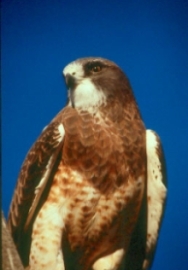 CDFG has initiated a Swainson’s Hawk inventory in response to the listing and more information can be found at the California Swainson’s Hawk Inventory. I am happy to report that this hawk was treated for soft tissue and head trauma at the VMTH and is now being cared for at the California Raptor Center. I am hopeful that she will be released soon! Thanks again to Officer Rivera for his exceptional professionalism and ability to control the situation quickly and safely – he helped to give this hawk a second chance! A big thank you goes out to Deana, Stella, and Krysta for their assistance. CDFG does not advise anyone to risk their safety and the safety of others to care for sick and injured wildlife. If you should find an injured bird or wild animal, please visit CDFGs Living with Wildlife to learn more. For more information about pesticide use and wildlife conflicts, please read A Sad End for a Coyote by WILs Stella McMillin. For more information on Swainson’s Hawks or other wonderful birds in our area please visit All About Birds by Cornell’s Lab of Ornithology or the Seattle Audubon Societies Bird Web. More information on wildlife rehabilitation and a complete list of wildlife rehabilitation facilities in your area can be found by clicking on the links.